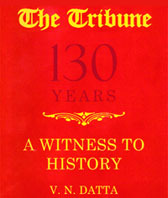 A CBI court today dismissed a plea for making Home Minister P Chidambaram a co-accused in the 2G scam case, holding there was no evidence to suggest his involvement in former Telecom Minister A Raja�s criminal conspiracy or that he took bribe, had illegal motive or abused his position as Finance Minister in 2007-08. 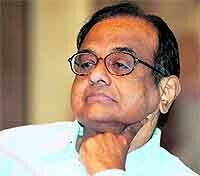 The trial court�s order ruling that the present Home Minister, and Finance Minister in 2008, P.Chidambaram cannot be made a co-accused in the 2G spectrum allocation case has undoubtedly come as a relief for the beleaguered UPA government. 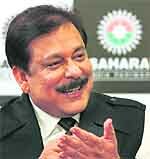 The Indian cricket team today lost its main sponsor after the Sahara group abruptly snapped ties with the Board of Control for Cricket in India (BCCI) on the grounds that the relationship between the two parties had become so strained that it was no longer possible for them to continue in business. In a fresh twist in the case against Dera Sacha Sauda chief Gurmeet Ram Rahim Singh, the complainant, who the police claimed had submitted an affidavit seeking cancellation of the FIR, today said in a Bathinda court that he had never filed such an affidavit. Seeking to put a lid on speculation of Congress striking a post-poll alliance with the Samajwadi Party in Uttar Pradesh, Rahul Gandhi today asserted that his party will have "no truck" with any party. The Lokayukta Court today issued summons to former Chief Minister B S Yeddyurappa and five others to appear before it on March 3 for their alleged involvement in an illegal land denotification case. The growing rift between Andhra Pradesh Chief Minister N Kiran Kumar Reddy and the Telangana protagonists within the ruling Congress appears to have reached a flashpoint. In two separate incidents along the Indo-Pakistan border in Punjab last night, the Border Security Force seized 23 kg heroin, valued at Rs 115 crore in the international market. 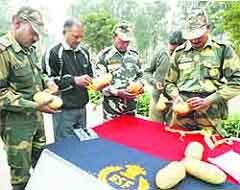 BSF personnel with the seized contraband.